A hazard means any source of potential damage, harm or other adverse effect on the health or safety of any person during the course of work. This form is used to record the hazards identified and the action that must be taken in order to minimize the hazard. 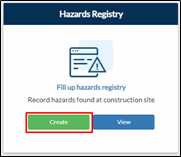 Project Page – Click Risk Management tab > Create on Hazards Registry tile. Search Bar – Type Hazards Registry then click on the result. Navigation Bar – Go to Risk Management > Hazards Registry.